Sails are taken down or furled in the reverse order of their set. Head sails, starting with furthest forward, and then the mainsail are struck or lowered. To furl the head sails, one crew member will ease the sheet, keeping slight tension on it, as another crew member will haul in on the furling line until the sail has wrapped itself around its stay. 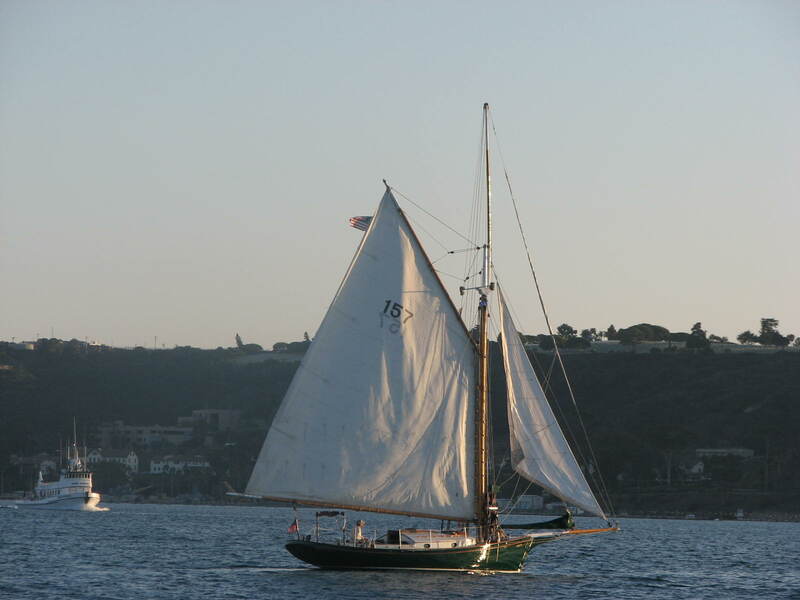 It is a good practice to haul in the furling line until at least two wraps of the sheet have wound around the stay. This will help prevent the sail from accidentally unfurling. Once sails are furled lines should be coiled and secured. The staysail is lowered using the halyard and secured to the staysail club. The vessel should be head to wind when lowering the mainsail. This takes any pressure off the sail and allows it to come down easily. 1.Make sure both the throat and peak halyards are free to run. 2.Ready sail ties around boom. 3.Tension the topping lift and lazy jacks. 5.On command, lower throat and gaff together keeping the peak slightly higher. It may be necessary to adjust sail as it is lowered to neatly fold onto boom. 6.When mainsail is all the way down secure sail ties and adjust any sail material that needs to be centered on boom. 7.Coil and secure all lines.